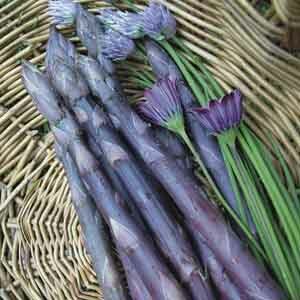 ‘Purple Passion’ has a more tender texture than green varieties and has about 20% more sugar content. This gives the spears a slightly milder, nutty flavor. There are none of the strings found in green asparagus that tend to make them tough so this is an asparagus that can be eaten raw. Use it to add color to salads or a relish tray. The purple color fades to green when cooked. Asparagus plants are perennial. Their ferny texture adds a soft, airy feel to the garden and the plants provide a reliable spring harvest for years to come. Delicious when lightly steamed and covered with cheese sauce or melted butter. An excellent source of vitamins and minerals. May be canned or frozen for later use. Wash fruits, vegetables and herbs thoroughly before eating. Very easy to grow in virtually any location. Plant in fertile, well-drained soil. Keep soil moist, watering freely in dry weather. Pick when tips are tight. No need to cut stalks, just snap off close to the ground. Harvest period is 4-6 weeks.